It's cute, it's adorable, it's award winning! 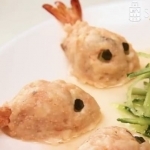 Share Food Home Cook and Lifestyle blogger, Shirley Tay, shares with us an amazingly fishy surprise - Adorable Steamed Prawn Paste Golden Carp. We couldn't quite figure out what went into making it but we were pleasantly surprised at how easy it was to cook it! Beautifully presented - Shirley Tay's award winning lifestyle blog Luxury Haven has literally brought to life a dish that is innovative and extremely creative. Otherwise her full recipe for this amazing dish is just right below!